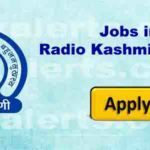 Advertisement Get Free Jobs Notification on Mobile Phone RADIO KASHMIR JAMMU INVITES APPLICATION FOR CASUAL NEWS EDITOR Regional News Unit of Radio Kashmir. Jammu has invited applications for Casual News Editor on assignment basis from eligible candidates residing in Jammu city and outskirts. Name of the post : Casual News Editor Essential Qualification : 1.